Like every blast of cold air in recent winters, there is already a big social media buzz about temperatures next week. Yes, it will be cold, but what comes next week is not unprecedented for early to mid-November. 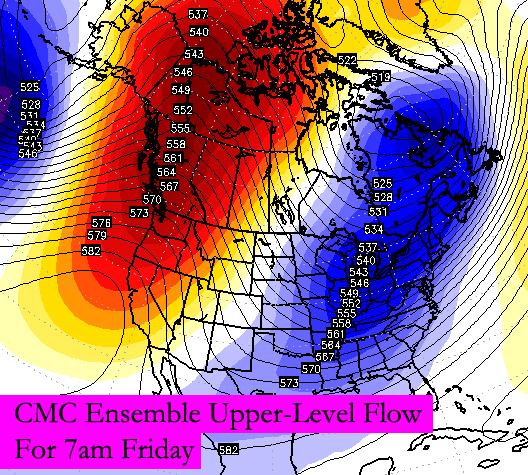 In the longer range, I like to use ensemble forecast models to gauge the strength and positioning of cold. 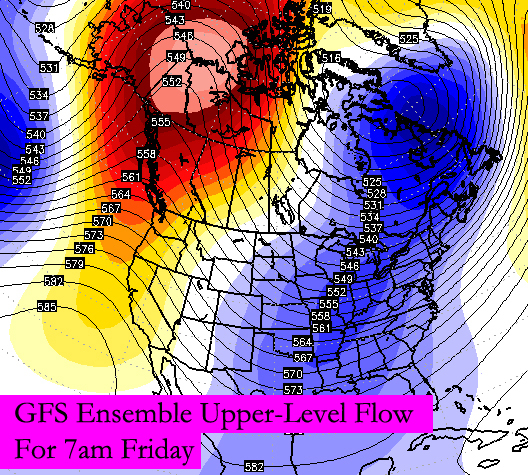 Ensemble forecast models are models made up of smaller models with the initial conditions changed slightly. All of these smaller models are run and may or may not produce slightly different results. A low spread in the solutions of an ensemble forecast model suggests a higher confidence that a certain weather event or pattern will happen; a high spread suggests a lower confidence forecast. In addition to looking at one ensemble model, a meteorologist can use other ensemble models and compare them to measure the confidence of a forecast. Ensemble models are often more reliable than other forecast models – especially a few days to a couple of weeks into the future – because outlier members of the ensemble models are easy to spot and can be discounted if needed. What does the average (mean) of these ensemble models say will happen by Sunday morning? This morning’s GFS (American) ensemble mean suggests temperatures roughly 5,000′ above the ground will be in the low 30s (-1°C) at 7am on Sunday morning, while the ECMWF (European) and CMC (Canadian) ensemble mean suggests temperatures a few thousand feet above the ground will be in the low to mid 20s (-3° to -6°C). Forecasting temperatures just above the ground are often easier to forecast than close to the ground due to uneven heating of the ground and terrain. Clearly, there is a large spread on what the temperature 5,000′ above the ground will be at 7am Sunday; this suggests there is limited confidence in the temperature forecast this weekend. Current thinking is that surface temperatures will be in the upper 20s and lower 30s early Sunday morning, but this forecast may change depending on the trend of models. Before we go forward, know that errors in the each of the models will be compounded with time. A large bust on a temperature forecast from a model this weekend will likely mean a large (or even larger) bust on the temperature forecast for next week. What does the mean of the ensemble models say will happen by next Thursday morning? There is reasonably good consensus with Wednesday morning’s ensemble model runs that temperatures 5,000′ over Cincinnati will be around -9°C (16° F). Accounting for the fact that temperatures are usually colder aloft than at the ground, cloud cover, and the rate of temperature changes near the ground, these maps support low temperatures in the 20s. Temperatures aloft rise a couple of degrees during the day Thursday, but there is some uncertainty in the cloud cover and precipitation coverage (if any at all). All things considered, highs will likely be in the 30s and/or 40s Thursday. Since 1870, the high temperature in Cincinnati hasn’t hit 40° 12 years on November 12th, 11 years on November 13th, and 19 years on November 14th. In other words, the historical odds of not making it to 40° on any one of these days is 8 to 13%. 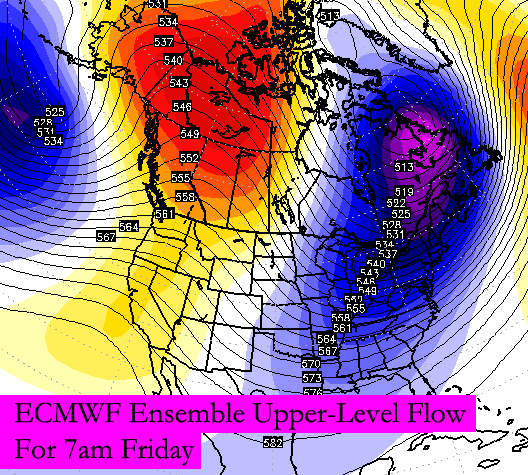 Why do I the think the ECMWF Ensemble ridge in the western United States is too weak? 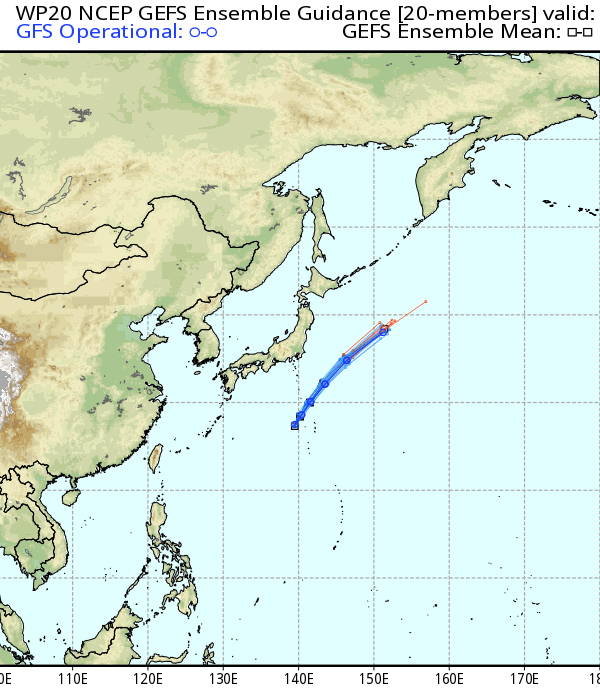 Because tropical activity in the Pacific suggests strong ridges and troughs near and over North America. This area of low pressure positioned where it is supports a ridge of high pressure just to the east of it, and a trough to the east of the ridge. This is very similar to what the CMC Ensemble above shows. 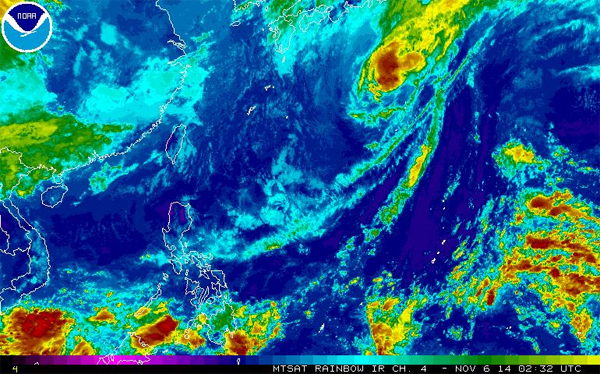 The exact track and fate of this Pacific low can impact how cold we get next week. For now, know that next week will be cold, but highs in the 30s and 40s are not uncommon in mid-November. Remember, we had a high of only 42° in Cincinnati this past Saturday.